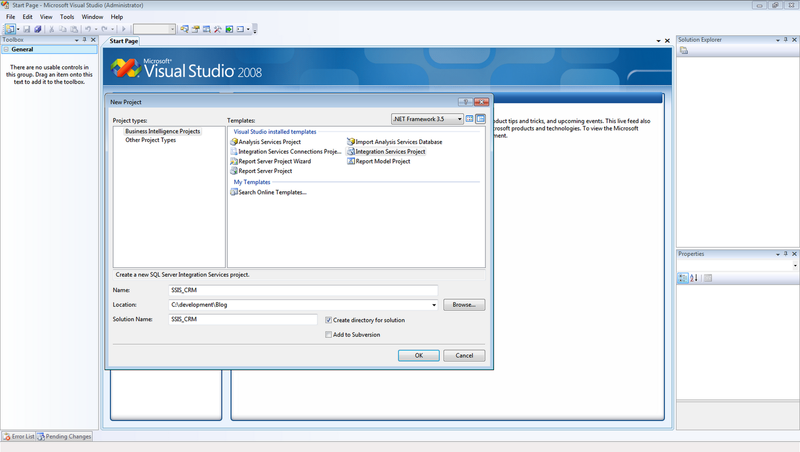 Sql Integration Services 2008 support libraries with target versions of .Net Framework 2.0, 3.0 and 3.5 so it is impossible to use SDK assemblies (which have 4.0 version of .Net Framework). Because of this reason it would be required to use Service reference instead of usual referencing of SDK assemblies. //as a KnownType (or it will throw an exception). Save, rebuild and close Visual Studio with script. That’s it and everything is ready to run package. Great blog post! Really powerful integration. However, I wonder: is this supported? Thanks, This approach is 100% supported because data is imported using CRM Endpoint. I couldn't build the Extension Class. Got the following error. Can you please describe what are you trying to achieve because I was not able to understand what you've meant from your message? Hi!, This example is very good working with an on-premise environment, but how will you create the client object for an Online environment? I have never tried to make it work with CRM Online but I believe that only authentication part will be changed. This tutorial is great for creating entities. However I remain blocked at this stage. For I would make in order to retrieve updates to existing features. A solution starting from this code? For Retrieving of records you can use Retrieve or RetrieveMultiple. For Update – you can use Update message. Yes I know but the problem is that we already get the GUID of the entity to update. (Retrieve (Entity Name, GUID, attributes)) But what code to use to go find the GUID of an item of my CRM from this script. For there a conflict between CrmProxy.Crm and Microsoft.Xrm.Sdk. Do you have a sample code for this from this code? It seems that it is impossible to use .Net 4.0 assemblies (Microsoft.Xrm.Sdk) inside Script Component because it can use .Net 2.0, 3.0 or 3.5. In case you have already developed some code to retrieve id of record you can convert it to be used in scripting component. I do not have this code without Microsoft.Crm.sdk ..
Do you own a sample code for this action? In case you have Visual Studio you will be able to develop this code. 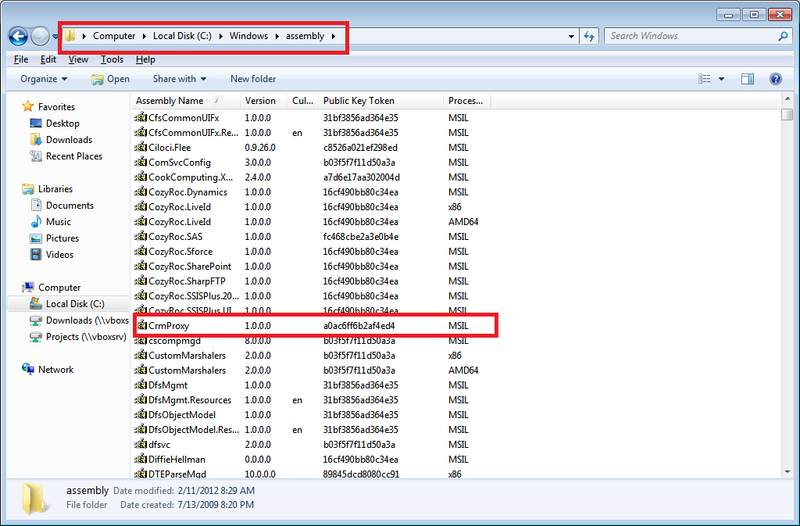 I cant deploy dll to GAC. Can i combine the crm proxy class in script component? Why are you unable to deploy assembly to GAC? Regarding usage of reference inside Script Component – I tried but I was not able to make it work. You can try. I haven't tried but you can. could You give me an online authentification sample code. Welcome, I don't have it so you can do it with yourself. Hi, I am trying to follow your example. However I am running into an error "The Security Support Interface provider(SSPI) negotiation failed." I tried many different things I found by searching on Google like changing the UPN to SPN and vice versa but in vain. It does not work. Can you please tell me why I am runnning into this error? Hello, thanks for the blog. It was really helpful. I was able to do insert/updates as well as retrieve of data. I still have a problem regarding inserting a lookup value like primarycontactid (or transactioncurrencyid). When I try to populate the field with the GUID of the contact (or currency) I receive a type cast error. Anyway when I try thiswith the proxy code it is throwing a syntax error. but unfortunately it is not working as well. Can you tell me how you handle with lookup values? Do you have an example for OptionSet? I have been trying to connect CRM 2011 via SSIS 2008. 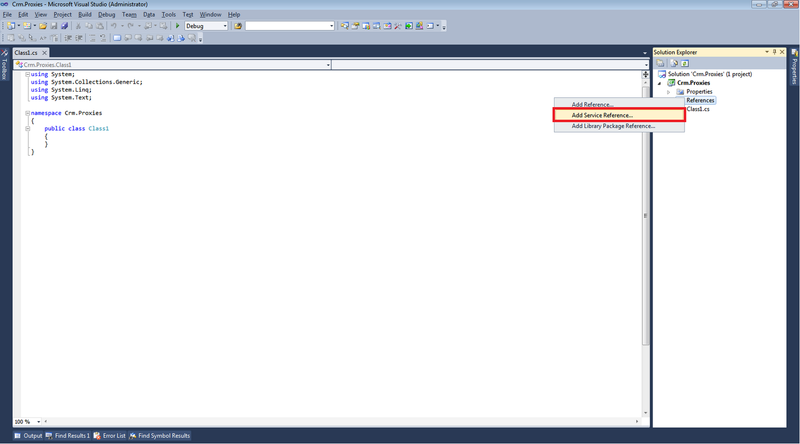 But it seems that the XRM metadata is not working properly in the SSIS 2008 environment. Can you please show code you are trying to use? I followed your method. 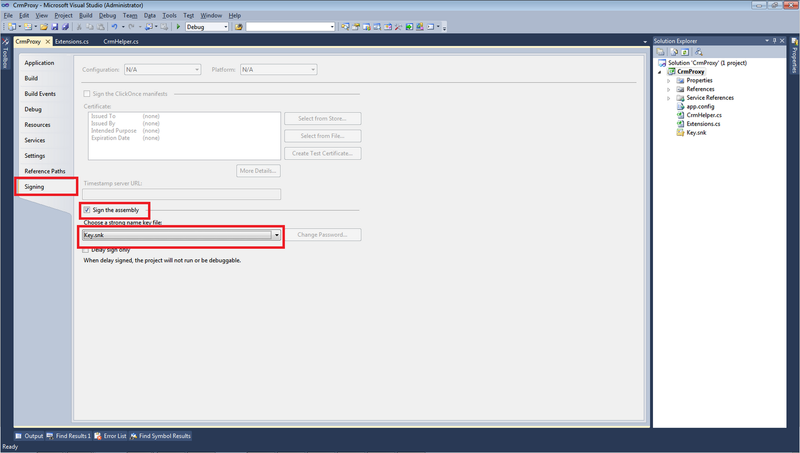 but I have currency field in crm 2011.
so In Script Component how to map to currency field from Execl sheet. I can suggest to use RetrieveMultiple to get currencyid based on name or ISO code of your currency column. Do you have any idea how to RetrieveMultiple to get currencyid. Even i am struck in Optionset field also. how to map optionset field(crm 2011) from excel sheet in script component. The service I'm trying to consume is https instead of http and this seems to be causing problems. "The provided URI scheme 'https' is invalid; expected 'http'. "There was no endpoint listening at http://URL/XRMServices/2011/Organization.svc that could accept the message. This is often caused by an incorrect address or SOAP action." Also, no service was found when I went to XRMServices/2011/Organization.svc. I had to go to XRMServices/2011/Organization.svc?wsdl instead. I feel like I'm very close to getting your solution to work, but can't quite make it. I do appreciate all the work you've done converting the 4.0 solution to 2011 though! You can get Service Description in other way – you can open CRM – Settings – Customizations – Developer Resources, click Download wsdl Under Organization Service header. There was an error while trying to serialize parameter http://schemas.microsoft.com/xrm/2011/Contracts/Services:entity. The InnerException message was 'Type 'CRMProxy.CRM.EntityReference' with data contract name 'EntityReference:http://schemas.microsoft.com/xrm/2011/Contracts&#39; is not expected. Add any types not known statically to the list of known types – for example, by using the KnownTypeAttribute attribute or by adding them to the list of known types passed to DataContractSerializer.'. I have no clue about this error. In the same example which you have posted, can you try add a reference to an account with a GUID and see if that works!. Let me know the outcome. Yes, I was able to get the Service Description. I wrote code against it and it was all valid. The problem happened when I tried to run the SSIS package. If the URI was https, it said it expected http. If I put http, it could not process the request. Unfortunately I don't have a lot of free time for investigation but I believe that you should do something with this lines. Hi, I'm having the same error. Did you solve it? if yes, how did you get it working? Did you solve the error? I'm getting the same error as yours nowadays. I am still stuck with the same error and not able to find a way out. Keep me posted if you get any way around this. so just adding KnownTypes to the Entity of the Extensions. I got it working now. Thanks for the tip. Have a nice day. Note, that it is not the complete variant of proxyclasses, but it is minimum to operate with the OrganizationServiceClient messages. How/where is the Entity Id added? I found a solution – do a left outer join at the OLE DB Connection source editor, including the GUID. The Update is then successful – you will need to also add error control as this will fail if you push in NULL GUID values. We want to insert 5 millions of Records using this approach what are the performance considerations? what are the changes that we need to do at both the ends? Do we need to do any changes at SSIS and MS CRM ends? Feel free to use this approach to import data to CRM. I have not clue regarding performance. You don't need to change anything on both sides before import. anybody has code to connect crm2011 online i am getting the error called "Error The provided URI scheme 'https' is invalid; expected 'http'. Parameter name: via"
Hi, could you please explain why did you need extension class and how did you know what to extend? Extension class is added to improve the speed of development. In case you would not include extension class work with attributes will become nightmare. Not sure what you've meant. 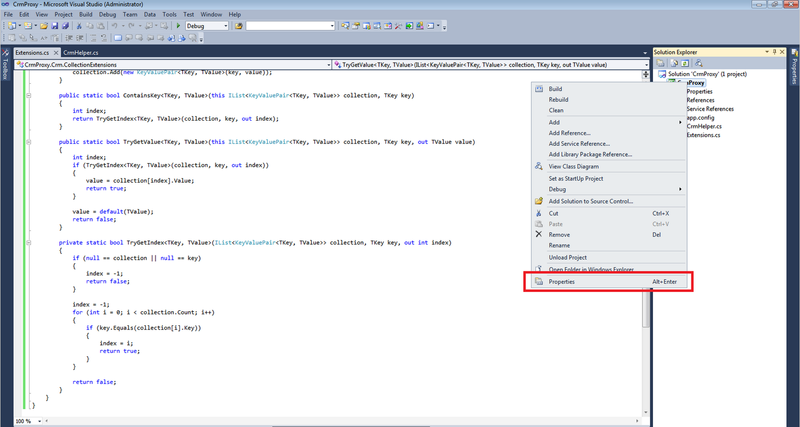 tryGetValue is method and not object or attribute. is there any body who encouter this kind of problem. What im only understand is the tryGetValue is not in the collection of the Entity Attributes. Namespace of your Extensions class should be the same as a namespace of your CRM Endpoint. Just starting to set up CRM. I'm trying to add the Service Reference, I needed to use Organization.svc?wsdl, and I'm getting the VS2010 error: "The server was unable to process the request due to an internal error." I turned on tracing, and it looks like the CRM error is: "MessageSecurityException: Security processor was unable to find a security header in the message…"
Do I assume I need to find a way to get my VS2010 to authenticate to CRM? If so, how? Open CRM – Settings – Customizations – Developer Resources – Download Organization Service. Save this file and add reference in VS to this file. I believe you will have to contact support engineers to solve your issues. iisreset cleared the problem. I can use the GUI to add the service reference. Glad that it was easy! 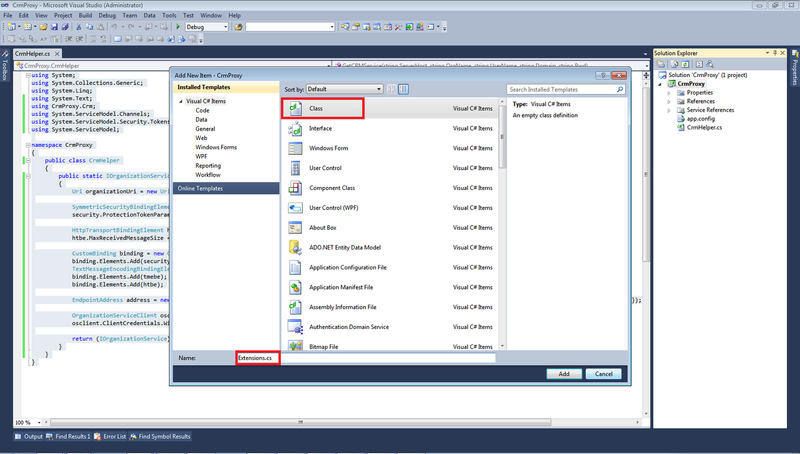 If CRM is running as 'Network Service' how do I authenticate with the SSIS package? Do I need to run CRM as a domain user? Yes, you will need domain account. I am using this approach to import data from a legacy system and it is working great. I don't see any field 'Target' in the Product entity. I cannot find help elsewhere on the Internet, so if you can help me – Thank you in advance. 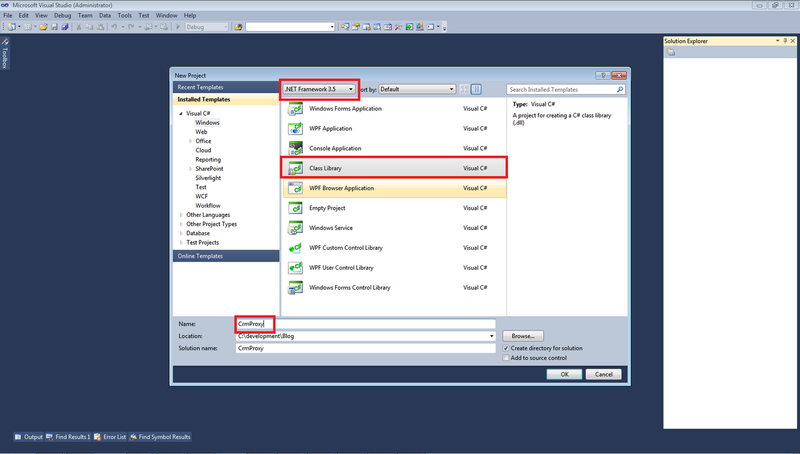 Now I am developing DynamicsCRM 2011 with SSIS and crmproxy in reference to your information. I want to create an Activity(Phonecall). 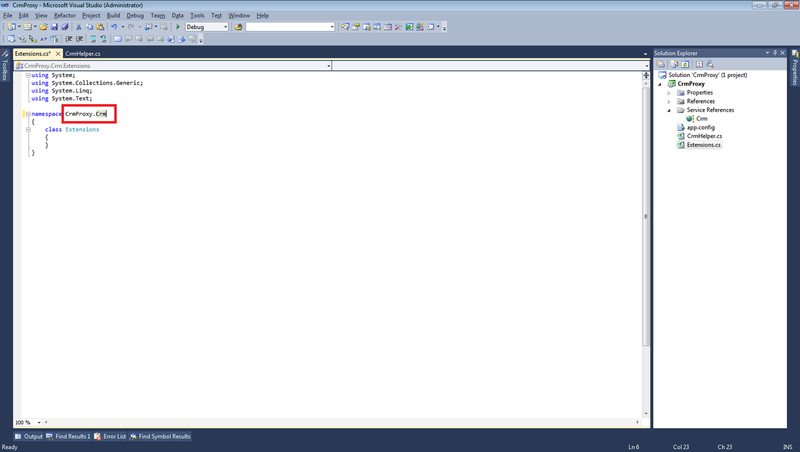 I executed this SSIS program, so the record was created in ActivityPartyBase table. =1(Sender) and =2(ToRecipient) record weren't created. So, Sender and ToRecipient weren't displayed in the PhoneCall screen. Maybe, this program does not set "to" and "from" definitely. To understand required format the easiest way is to retrieve already created phonecall record using C# and investigate output. I believe you will find EntityCollection inside from and to fields. But there is little infomation about it with SSIS and crmproxy. So if you give further information to me, I thank you very much. I could resolve this problem. 1. I added the next line to crmproxy. 2. 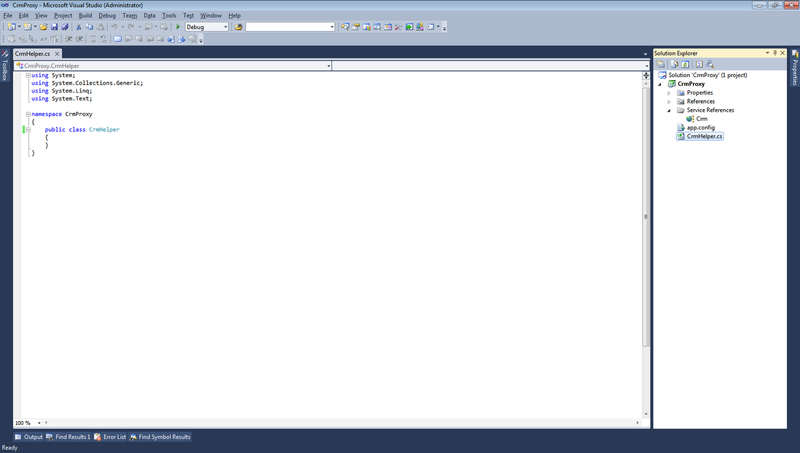 I added the next lines to SSIS program. Any chance you can do this over with VS2012/SQL2012 using .net 4.0 and xrm? It could work but I haven't tried it yet. Thanks in advance, you have always been very helpful at social.crm development forum. I am following your steps and i am trying to connect to our live server, so basically moving data to our Live CRM server. (Production environment). I am getting following error, can you please point in right direction, this is my first time in the world of DTS and SSIS :). An error occurred while receiving the HTTP response to http://URL/XRMServices/2011/Organization.svc. This could be due to the service endpoint binding not using the HTTP protocol. This could also be due to an HTTP request context being aborted by the server (possibly due to the service shutting down). See server logs for more details. It looks like our server only accepts HTTPS, how do i get to work? for update Should I add newcontact.Id = Guid("xxxxxx"); right?? I guess my guid Id is not right . I haven't tried. What issues do you have? when i tried to connect i get the error as "There was no endpoint listening at https://home89.api.crm.dynamics.com/home/XRMServices/2011/Organization.svc that could accept the message. This is often caused by an incorrect address or SOAP action. See InnerException, if present, for more details." and inner exception i get as "The remote server returned an error: (404) Not Found." Hello, Your URL is wrong. I believe it should be like https://home89.api.crm.dynamics.com/XRMServices/2011/Organization.svc instead of https://home89.api.crm.dynamics.com/home/XRMServices/2011/Organization.svc. You will have to rewrite your assembly. hey Andrii thanks for reply but can you please let me know that what needs to be change from this post code? i have tried changing my code and now i am getting this error "Secure channel cannot be opened because security negotiation with the remote endpoint has failed. This may be due to absent or incorrectly specified EndpointIdentity in the EndpointAddress used to create the channel. Please verify the EndpointIdentity specified or implied by the EndpointAddress correctly identifies the remote endpoint." and innerexception says "An error occurred when verifying security for the message." I have the same issue, Did you solve your dynamics online authentication ? Impressing! Followed the tutorial and finally the KingwaySoft stuff. Andrii, thank you. updates into an XML file which is put on a file system. 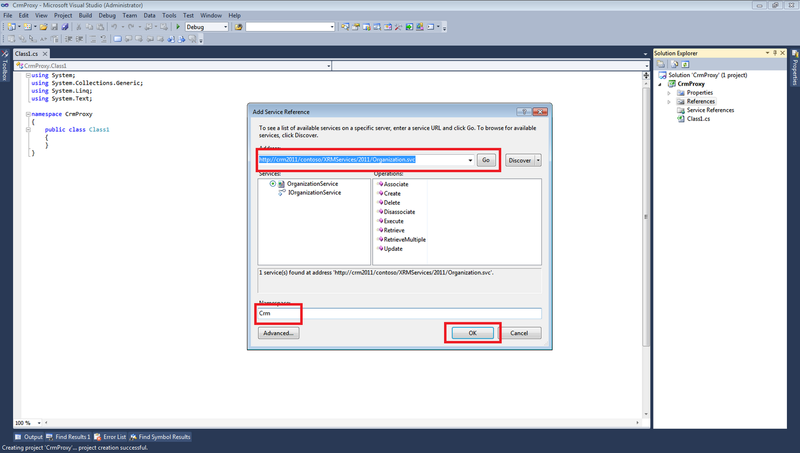 SSIS picks up this file, extracts identificators, fetches the matching entities, updates this entities and saves those back to CRM. Since I am new to SSIS(two days of experience) I need some general advice – what pattern to use. Should I use XML Task or XML file as a source? As far as I understood Xml DataSource should work. I am trying to "read" data from CRM, of SSIS 2008. Obviously I can use the 3.5 dialect only. I found your example of how to script source from CRM in SSIS 2012, but this didn't work for me. May be there is some tiny stupid detail I am missing, but I cannot create query. I mean I can, but when the matter stops once I am coming to creation of Conditions. The query.Criteria.Conditions doesn't have the Add method. What's wrong here? Sure I did. It's an amazing plugin, but the point is that I am not a freelancer and my management was advised by a consultant that there is no need to buy it. I know on my skin that it is extremally cost effective plugin, I tried it in developers mode. But the reality is that in our company this is the first attempt to adopt MS CRM and none of us is really experienced with it. This is why the consultants credibility is higher than ours. And we realize the fact that the consultant not using the Kingsway charges us higher. Life is hard. Anyhow, I am just curious, why the Conditions dropped Add method? Sure I worked around but didn't like the idea. Not sure why there is no such method. What I can suggest is instead of using Ad method try to create collection of conditions and assign it to a property Conditions directly. PS try to buy this adaptor because it will solve a lot of issues now and in future. This is exactly what I did 🙂 Actually I don't see any other way. Management doesn't see a reason to buy as it is just one time task, to integrate the existing system with the MS CRM. Dunno – may be they're right. Adrii, sorry for bugging you. System.ServiceModel.Dispatcher.NetDispatcherFaultException: The formatter threw an exception while trying to deserialize the message: There was an error while trying to deserialize parameter http://schemas.microsoft.com/xrm/2011/Contracts/Services:RetrieveMultipleResult. The InnerException message was 'Error in line 1 position 1058. Element 'http://schemas.datacontract.org/2004/07/System.Collections.Generic:value&#39; contains data of the 'http://schemas.microsoft.com/xrm/2011/Contracts:OptionSetValue&#39; data contract. The deserializer has no knowledge of any type that maps to this contract. Add the type corresponding to 'OptionSetValue' to the list of known types – for example, by using the KnownTypeAttribute attribute or by adding it to the list of known types passed to DataContractSerializer.'. Please see InnerException for more details. This didn't work out. Not sure where and how this attribute should be added. Now my challenge is to get metadata for the specific OptionSet. Do you guys have any ideas or leads? You should try to use OrganizationRequest and fill RequestName with RetrieveAttribute and fill collection items EntityLogicalName, LogicalName and RetrieveAsIfPublished. Guys, I have another question. I have a task which extract optionsetmetadata. I don't want to hit the CRM again and again for getting it. I'd like to use caching here. Is there any good practices? Not sure how to organize cashing but I believe it would not harm productivity of your CRM Instance. Looks like this is my last question: I am going to keep credentials for an CRM account in the .dtsConfig file. What is the proper way to protect this data? Can I encrypt .dtsConfig file like the web.config? Regarding this point I'm not sure. You should check search engines. I believe you will find the best approach there.